Songs of Eretz Poetry Review is pleased to introduce to the readership Howard Stein, another new Frequent Contributor. Howard will be this week's Poet of the Week. His bio may be found on the "Our Staff" page. Poet's Notes: Each year for at least twenty years, I attend the annual fall retreat of the High Plains Society for Applied Anthropology held at Ghost Ranch (pictured) in northern New Mexico. The sense of place inspires poetry in me every time I go. This little poem is from late September 2017 and strives to do the impossible: to fathom the unfathomable and to bear witness to my awe whenever I am there. Editor’s Note: I enjoy Howard’s use of rhyme here as well as the magical moment when the imagined becomes reality. 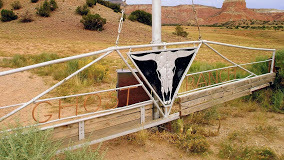 What an inspiring place Ghost Ranch must be! Poet's Notes: This poem also comes from the annual fall retreat in late September 2017 at Ghost Ranch. 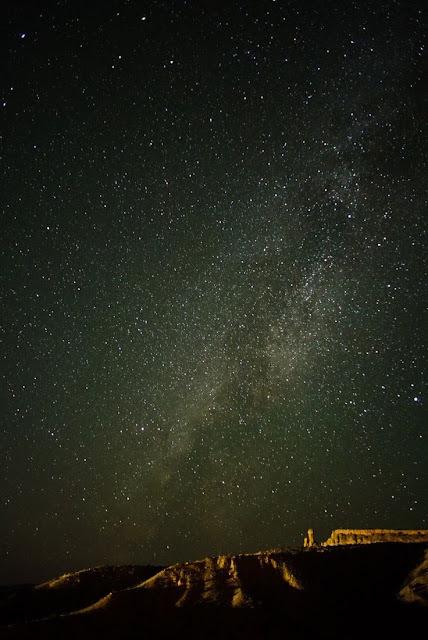 As awe-inspiring as the geology of the place in northern New Mexico is, the sky (pictured) ultimately dominates the landscape and the imagination. This poem comes from my walk at night beyond the incandescent lights of Convocation Hall.